ASIC’s Indigenous Outreach Program spoke to people in Indigenous communities about the financial issues that affect them and people said they needed help sorting out their money problems and dealing with family pressure about money. 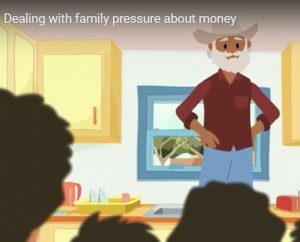 From this, ASIC created two videos which follow the journeys of Uncle Charlie and Lisa as they learn how to take control of their money to look after themselves and their families. The Indigenous creatives at 33 Creative helped put the videos together. Dealing with family pressure about money.